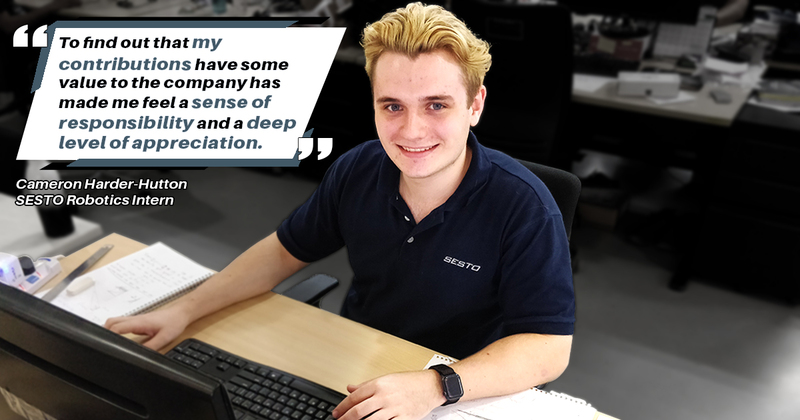 We spoke with Cameron Harder-Hutton, software engineering intern to find out more about what he does daily and his internship experience so far in SESTO Robotics. Read on to find out more! Tell us a little about yourself and the job that you do. What are your day to day responsibilities? Hi! My name is Cameron and I am a final year Software Engineering undergraduate in The University of Queensland, Australia and I am working as an intern for SESTO Robotics. Currently, my tasks revolve around robotics applications and working with the team to develop high level software applications for SESTO’s Automated Guided Vehicles (AGVs). On a daily basis, my tasks include researching, designing and development of applications followed by testing on the AGVs. Do you have any memorable stories during your time at SESTO Robotics? What do you like about the work culture here? When I started my internship, I was expecting to be given some tasks similar to what the company is developing in order to learn. However it was quite a pleasant moment to find out what I am working on may be going out into production. To find out my contributions has some value to the company has made me feel a sense of responsibility and a deep level of appreciation.As for work culture – it is very special here. Based on my experience, there are not many companies where the CEO will address you by name, let alone have a drink with you! But in all seriousness, if I were to describe the work culture to a non-employee, I would say that SESTO Robotics reveres and respects the morale of its teammates just as highly as the quality of engineering. How has working in SESTO Robotics developed your career? SESTO Robotics is my first industry internship, and it is also my first time working in Singapore as well!Despite being in my final year of university, almost everything I have completed here is new to me. No doubt the learning curve has been steep but the greatest benefit that SESTO Robotics has had on my career is the new path that has been forged for me. I never thought of robotics as something I was interested in but now I believe that it is something I would enjoy pursuing full-time after I graduate. On a personal level, what do you wish to achieve?